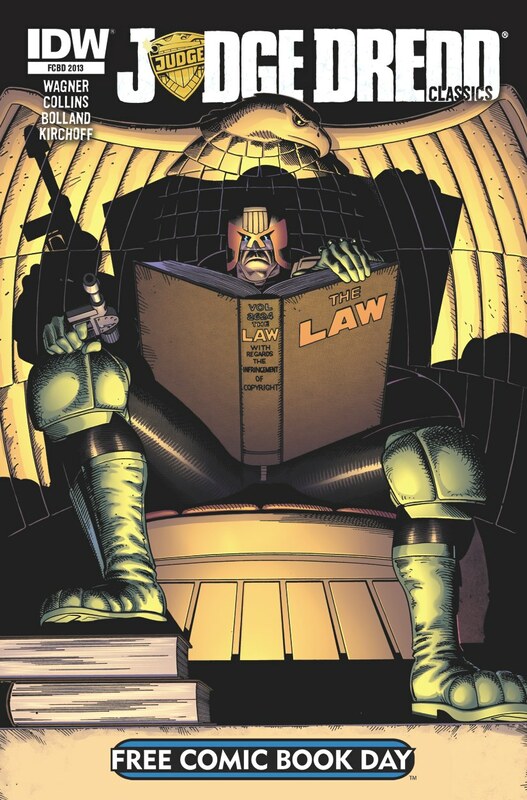 Get Ready to Experience the True Colors of the Law in JUDGE DREDD CLASSICS! San Diego, CA (April 12, 2013) – Following the success of their ongoing series of new Judge Dredd comics, IDW is bringing 2000 AD’s classic stories back as they’ve never been seen before… in color! Beginning with a special Free Comic Book Day issue on May 4, JUDGE DREDD CLASSICS will bring the stories that started it all to a new audience and a new age. The Free Comic Book Day issue will offer the fan-favorite “Judge Death” stories written by John Wagner, illustrated by Brian Bolland, and given vivid new life by colorist Charlie Kirchoff. And then in July, the monthly JUDGE DREDD CLASSICS series, also featuring new colors by Kirchoff on every issue, will begin with the seminal “Block Mania”/”Apocalypse War” storyline scripted by John Wagner and Alan Grant, and illustrated by Mike McMahon, Ron Smith, Steve Dillon, Brian Bolland and Carlos Ezquerra. As an added bonus, artist Jim Fern will be providing all-new covers for every issue when the series makes its monthly debut this summer. The Free Comic Book Day special will feature a newly colored cover by the inimitable Brian Bolland. In addition to these classic tales from Mega City One being shown in a new light to longtime fans of Dredd, JUDGE DREDD CLASSICS will also provide a perfect jumping on point for readers that have always wanted to get a peek under the helmet, but weren’t sure where to begin. “Much like we did with our DOCTOR WHO CLASSICS series, I’m happy to expose fans new and old to these wonderful stories from years past, and even moreso to have Charlie Kirchoff again bringing new hues to such amazing artwork,” said Chris Ryall, IDW’s Chief Creative Officer. The post-apocalyptic world created over thousands of pages of 2000 A.D. is one of the richest in comics history, and IDW couldn’t be more excited to continue bringing that to new generations of fans. As always, fans are encouraged to make their own decisions, but this summer it should be advised that not buying JUDGE DREDD CLASSICS could result in life in the Iso-Cubes! This entry was posted in Columns and tagged 2000 A.D, alan grant, brian bolland, charlie kirchoff, doctor who classics, idw, john wagner, judge dredd, matt smith. Bookmark the permalink. Follow any comments here with the RSS feed for this post. Post a comment or leave a trackback: Trackback URL.